American Chopper Senior vs. 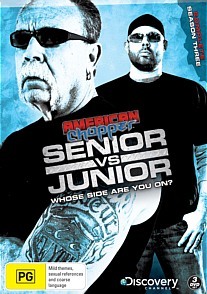 Junior Season 3 DVD Review American Chopper Senior vs. Junior has been recently cancelled which comes as no surprise to me. Back when American Chopper began in 2007 it was all about making motorcycles that look and sound awesome. The underlying conflict between Paul Teutul Sr. and Jr. was also a focus of the show, but was never the point of it. Seven years later American Chopper Senior vs. Junior was created, which changed the focus of the show to make it more about the fighting and less about the bikes. Senior vs. Junior is now into its third series, and the verbal fights between father and son are more annoying than ever, making this the worst series yet. Season 3 starts out like the first two beforehand. We are given a re-cap of all the argy-bargy from the previous season and then we get straight into it. But the problem is Senior vs. Junior has never known what to focus on more, the constant verbal arguments between Paul Sr. and Jr. or what the whole point of the series is, making cool bikes. You catch glimpses of the boys hard at work in the shed, making complicated chassis and accessories for their client’s vehicles, but the show somehow finds a way to relate everything to the domestic dispute. This dispute may have been engaging and interesting if the people that were a part of it made it sound believable. Confrontations between Senior and Junior are laughably bad, and any conversations held between Senior and his wife sound more scripted than a soap opera. The whole thing is frustrating to watch but it sure makes the little time left in an episode to focus on the bikes a lot more enjoyable. American Chopper Senior vs. Junior has been recently cancelled which comes as no surprise to me. While the manufacturing of motorcycles is still a fascinating process to follow, Senior vs. Junior made no attempts at trying anything different from its predecessor. Season 3 showed that the producers and even the employees of Senior and Junior’s workshops are running out of ideas, with familiar bike designs being pulled out of the archives and being shown again like they’re brand new pieces of work. Hopefully father and son can put their differences aside, start fresh, and if they’re lucky enough to get another crack at a reality show, just do what they’re good at; making bikes.